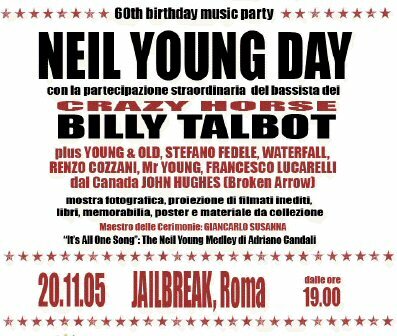 Last month, for Neil's 60th birthday, fans in Italy held a Neil Young Day. The highlight of the day was an acoustic solo set by the Crazy Horse bass player Billy Talbot. Thrasher's Wheat is pleased to present the story from that day. Our tale of adventure comes from John Hughes, a longtime Neil Young fan, and musician in Broken Arrow: The Neil Young Tribute where he plays guitars, harmonica, and lead vocals. This is the story of Billy, Broken Arrow, and Neil. I'd like to thank Thrashers Wheat and all of my Rusty friends for their interest in my trip to Rome for Neil day. The experience started shortly after my arrival on Saturday, November 19th, the day before the event. I was in my hotel room and I received a phone call to be ready at 9:00 p.m. to go out for dinner. "And bringa your six stringa too!!" A friendly young couple showed up at 9:00, and drove me to the residence of one of the organizers. I arrived to find a large flat; tastefully decorated with Neil and anything Neil related, memorabilia. Posters, autographed photos, records, books, videos, etc. I was in awe. The champagne corks popped, and at least four courses of pasta dishes followed. Then, out came the guitars. It was a delight to play song after song with everyone in the room knowing every chord, note, and lyric. It was an evening I'll never forget. Now it's late and tomorrow is the big day. Rush back to the hotel for some sleep. The next day, the same couple picked me up and drove me to the venue. I walked in and there were people running everywhere, setting up gear, etc. Every possible bare space in this huge club known as Jailbreak, was covered with poster and pictures of Neil and anyone else Neil related. From the very early days up to today, they had it well covered. The evening began with a film of rare live appearances, TV. Shows with Springfield, CSNY, etc. Many of them a first for me. Following that, the bands began to perform. The talent in that room was amazing. All in all, there were about 7 performances. I performed: I am a child; A man needs a Maid, and Double E, all solo acoustic. 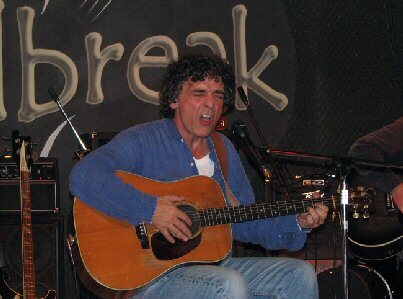 Then Billy Talbot took the stage and played his heart out for everyone. The highlight of his performance for me was when he did Danny Whitten's "I don't want to talk about it." It was powerful and moving. Billy is a fine guitar and piano player and I love his voice. When the show was over, I was having a conversation by the bar with Billy Talbot when I was beckoned to the stage for the grand finale of the evening. Much to my surprise, Billy said "C'mon, John, lets go!" 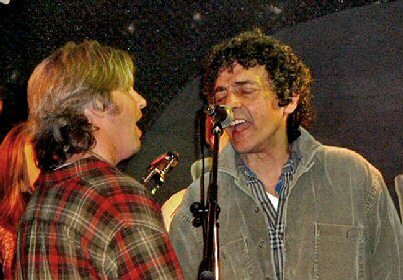 Next thing I know, I'm singing "Keep on Rockin'' in the free world" and Billy is sharing the mic with me, singing the harmony. HIS harmony part! What a day to remember: Neil day in Rome. There are pictures of the event on the website Broken Arrow: The Neil Young Tribute. The quickest way to find them is to click on the News tab. Also, there is a video of "A man needs a maid" on there now as well. Many thanks John and Broken Arrow! More on bands covering Neil Young songs. 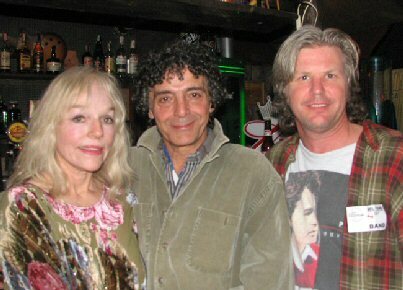 Also, see Billy Talbot and Crazy Horse, the "3rd Best Garage Band in the World". Great picture John. Glad to see someone else is a huge N.Y. fan and also wearing a "souvenir" from John Prine. My two Favorite S/S of all time. Down by the river near Lake Marie.